Macedonian, Interregnum of 288 to 277 BC. Macedonian Kingdom, Interregnum period, 288 to 277 BC. 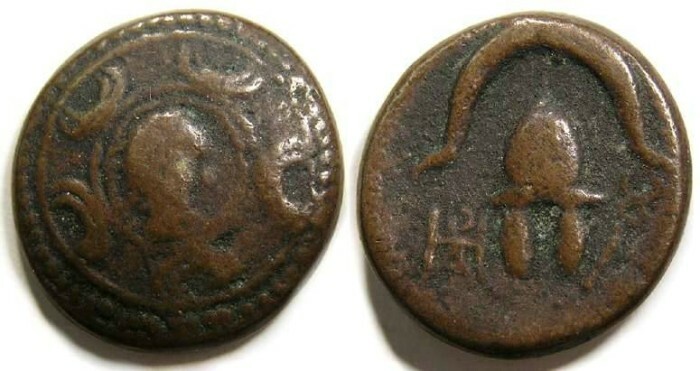 These anonymous types were struck in the period followng Lysimachos over throw of Demetrios Poliorketes, when there was no firm ruler on the Macedonian throne. Size : 15.3 x 16.4 mm. Weight : 3.06 grams. Obverse : Macedoninan shield with a Gorgon head in the centre. Reverse : Macedonian helmet with a caduceus to the right, and a Greek letter monogram to the left. There may have been a B and A flanking the helmet, but if so they are off the flan (although I see no trace of the B and there is enough room for it if it had been there).